Filing a workers’ compensation claim in Boston is typically considered the exclusive remedy an employee has in seeking compensation from his or her employer in the event of occupational injury or disease. However, that doesn’t mean workers are stripped of all other options. In some situations, third-party litigation may be appropriate. If the accident occurred while you were at work, but as a result of negligence from another person or company, an independent lawsuit for damages might be the best course of action to protect you from damages. A recent example played out before the Alaska Supreme Court in Conley v. Alaska Communications System Holdings, Inc.. The legal principles presented in the claim mirror many of those that arise in Massachusetts work injury lawsuits. Here, the plaintiff was a tractor-trailer driver who was seriously injured while unloading cargo at work. According to court records, he was delivering a load of cargo to a communications firm when he met with the warehouse forklift director to coordinate the drop-off. Per the warehouse policy, every use of the forklift required the operator to hold a short meeting to advise those involved of how the lift would be conducted and what each party’s role would be. In this case, she did not do follow protocol. The trucker signaled for the forklift operator to unload. The transfer did not go smoothly. There were a few stops and starts, and at one point, despite being advised by his employer never to do so, the trucker stepped in front of the reel as he removed the chain. The reel tilted toward him and then fell onto his lower back. He suffered a punctured lung, fractured ribs, a chipped hip socket and several broken lumbar vertebrae. He was also later erroneously diagnosed with Lou Gehrig’s disease (and given 18 to 36 months to live), but later determined he suffered from a neurological motor neuron syndrome related to the trauma of the accident. The trucker secured workers’ compensation benefits. But then he also sued the forklift operator, a well as her employer, for failing to provide equipment and training. 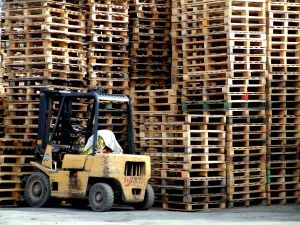 The case grew more complex when the forklift operator’s employer filed a third-party complaint against the trucker’s employee for negligent training and retention, alleging that he had numerous previous safety violations. Those included documented write-ups for slipping on ice, purportedly taking excessive breaks, dropping a heavy metal plate on his foot, throwing a hammer in a fit of anger, running a forklift through a sprinkler and forgetting to unload several items from his truck. The cross-claim against the trucker’s employer was later dropped, but allowed to be considered for the limited purpose of allocation of fault, should the jury decide in the trucker’s favor. The claim against the forklift operator individually was dropped. The jury found that the forklift operator’s employer was negligent – but that its negligence was not a substantial factor in causing the trucker’s harm. The trucker appealed, arguing, among other things, that the court had erred in allowing evidence of his previous write-ups to be considered by the jury, as he maintained they weren’t relevant. However, the decision was upheld by the state supreme court. It was noted by justices, that there were other issues upon which the worker might have had valid grounds for appeal – but those issues were not preserved by his attorney during trial. Once again, this illustrates how critical it is in these types of claims for a worker to secure the services of an experienced legal team.